New Delhi, March 21: Union Minister and top BJP leader Smriti Irani has been named in the first list of candidates for the upcoming Lok Sabha elections 2019 released by the party on Thursday. Irani, a current Rajya Sabha MP, has been fielded from Uttar Pradesh's Amethi, a Gandhi family bastion. This is the second time Irani would be filing her candidature from Amethi, the constituency currently held by Congress president Rahul Gandhi. In 2014, though unsuccessful, she drew the highest number of votes a runner-up candidate has ever secured in the seat. LK Advani Not Named in 1st BJP List For Lok Sabha Elections 2019, Amit Shah Replaces Him From Gandhinagar. The actor-turned-politician had received 3,00,748 votes against Rahul Gandhi, who was voted by 4,08,651 voters of Amethi. The victory margin, nearly of 1 lakh votes, was way less than the margin of 3.5 lakh votes with which the Gandhi scion had defeated his nearest BSP rival in 2009. 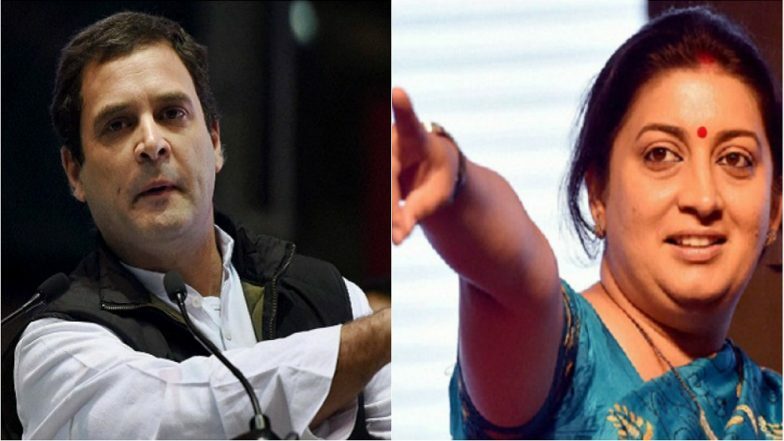 A section of the pollsters, though admitting that the Narendra Modi wave is not as strong as 2014, have predicted a tough battle in Amethi -- where Irani has been active over the last five years. "She has been actively reaching out to us, despite losing the last general elections. Her presence has been felt in the last five years," said Ramesh Singh, a resident of Amethi. Earlier, the first list of candidates issued by the Congress had named Rahul Gandhi as the candidate from Amethi, and his mother Sonia Gandhi from Rae Bareli. Several opinion polls, including the latest conducted by Times Now-VMR, claim that the Congress would only be restricted to these two parliamentary seats in Uttar Pradesh.